I've got a couple of more Kat Scrappiness projects to share with you today! 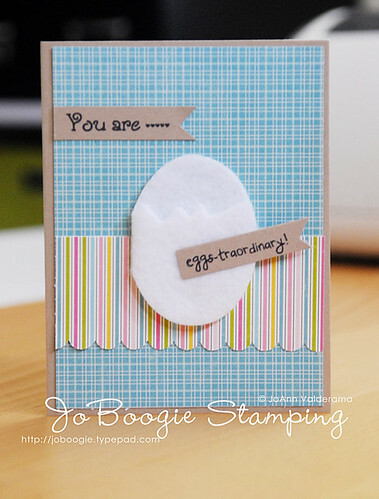 I decided to create a super simple card in time for Easter, but not necessarily FOR Easter. :) I think these little eggs are cute for any occasion - maybe even baby showers. How cute would it be to stick a little chick peeking out from inside the egg? Hope you enjoyed my projects today! Have a wonderful weekend! I'm super excited because I have a layout to share with you today! I don't know what it is about using Kat Scrappiness felties but they really make me want to scrapbook and work on LAYOUTS again! supplies: lots of old stuff in my stash that I used: Bazzill CS, die cut laser paper from KI Memories, journaling block from Making Memories, DP from Chatterbox, transparency from Hambly and the adorable felt sailboat is from Kat Scrappiness! I'm a little late with this, you're going to have to forgive me. It's been one heck of a month! I won't go into details, but just know I'm so behind with things - including Project Life, and all of my YT video commitments. Wah! I just want things to get back to normal again! Anyway, here's my video for the month showcasing my Kat Scrappiness Projects! here are the links to the felties I used this month! Use EASTER10 for 10% off on any size order! Use FREESHIP for free shipping over $35! Kat Scrappiness Haul + Projects video! I meant to post this earlier, but time got away from me! Here's my little Kat Scrappiness Haul video + the project I made for the month! I know some of you are more visual when it comes to looking at stuff so I wanted to share in a different way! Wow, can you believe it?! This is the third layout I've created in the past week! Yay for Kat Scrappiness goodies and felties! I've been so inspired to sit down and create! So this layout is 8x8 and it was really a great size to work with. I usually don't scrapbook pages smaller than 12x12 or 8.5x11 but this was fun to work with. It pushed me outside of my comfort zone! I know I usually try and post something non-crafty on Saturdays but I couldn't resist sharing another scrapbook layout with you all that features another set of fabulous felties from Kat Scrappiness. I got these adorable elephant baby die cuts and decided to create a baby layout. I thought they would be super perfect! I think they would also be perfect for a baby shower card for a friend. Don't you think? 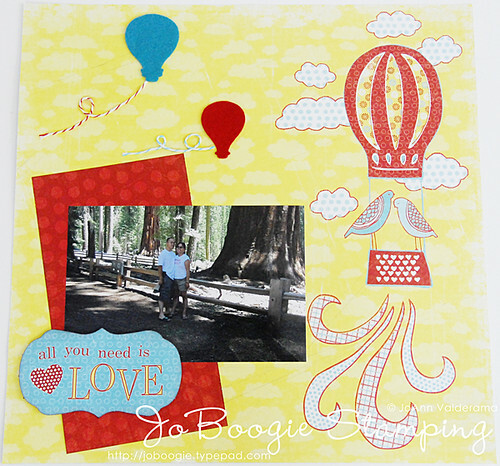 I'll say it again: I'm really loving creating scrapbook pages again! Hope the mojo continues! Kat Scrappiness Project: So Sweet! You know, I've been in a scrapbooking slump for a few months now. I don't know why - I think it's because cards are easy to make. They require very little time create and the gratification from creating a card feels so good: less time + super easy = BIG ACCOMPLISHMENT. But I've said it before: I really need to buckle down and create more scrapbook layouts. Seriously. I looked at M's album and the last official layout I created for her was when she was 15 months! She'll be 3 years old next month! I need to just create some layouts. You know what? I had a great time scrapbooking again! I know my layout isn't embellishment intensive or graphically inspired or shabby chic or whatever the trend is now. For once I really didn't get hung up on any of that! I really loved playing with this felt die cut! Even though it's not the ice cream cone M is eating in the picture I still thought it went along with the theme of the layout. Yay! Thanks so much for stopping by today and visiting my blog! I appreciate the comments - keep 'em coming! :) Have a wonderful day! Kat Scrappiness Project: Chocolate Bunnies!